Salmon anglers continue to reel in a mix of coho and king salmon in many marine areas and rivers all across the state with plenty of good action continuing well into the fall. In this week’s seafood recipe of the week, outdoor cookbook author Tiffany Haugen who has a passion for preparing Pacific Northwest seafood offers a simple yet delightful Lettuce Salmon Wrap recipe. Haugen has been contributing many of her delicious recipes for the Reel Time Northwest Fishing blog. Each of her recipes will be related to the “catch” of the week. She and her husband Scott Haugen live in Western Oregon, and many know Scott for his writing expertise on fishing and hunting. Tiffany’s recipes have been posted regularly on Wednesdays with many other Seafood Recipes of the Week or tips and advice on how to prepare some of the best local fish and seafood. This season we have weekly recipes and advice through October on how to cook up and dish out a wide variety of local seafood by experts like Chef Tom Douglas; Anthony’s Restaurant; tackle shop owners; local seafood-market owners; and fishing guides and charter services. Remove any bones from fish pieces. In a skillet, sauté salmon in olive oil on medium-high heat 1 to 2 minutes or until no longer opaque. Add garlic, water chestnuts, sauce and sugar sautéing an additional 2 to 3 minutes. Remove from the heat and mix in green onions and sesame seeds. Separate lettuce leaves. Divide fish mixture evenly among lettuce leaves. Or serve a portion of fish with leaves on the side for do-it-yourself wraps. The Haugen’s latest book is Cooking Seafood with a wide range of creative recipes including the one mentioned above, and another book is Smoking Salmon & Steelhead. 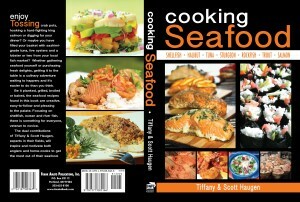 For more information on cookbooks, recipes or to read her blog, go to www.tiffanyhaugen.com website. Books can also be ordered at www.scotthaugen.com.